On May 22, 2013, Pope Francis shocked the world when he delivered an off-the-cuff homily in which he declared that Atheists could be saved by doing good works because Jesus died for everyone (see article). The amazing assertion was, of course, thoroughly unbiblical. It violated two very fundamental biblical principles. It is true that Jesus died for all people (1 John 2:2), but it is also true that his atoning sacrifice must be appropriated individually by placing one's faith in Him as Lord and Savior (John 3:16). Forty-eight hours after Pope Francis made his shocking observation, the Vatican attempted to clarify his remarks. They did so through an official spokesman, a priest by the name of Thomas Rosica. He said that people who are aware of the Catholic Church "cannot be save" if they "refuse to enter her or remain in her." So, the Pope's unbiblical assertion was "corrected" by another one that is equally unbiblical, for no one is saved by church membership. Salvation is not vested in an organization like the Roman Catholic Church. It is to be found, instead, in a person — the Messiah whom God sent to die for our sins, namely, Jesus of Nazareth. An Irish Catholic commentator, Cahir O'Doherty, wrote, "It makes for an interesting spectacle to see the infallible pope being corrected by his handlers, doesn't it?" He then added, "If I was Pope Francis, I'd be employing a food taster right about now!" If Atheists can be saved by doing good works, what is the purpose of the Church? And why did Jesus bother to come to this earth and experience the horror of the Cross? It is rather painfully obvious that Pope Francis needs to start reading his Bible on a regular basis. 1) Cahir O'Doherty, "Vatican corrects infallible pope: Atheists will still burn in hell," www.IrishCentral.com. The press loves to cut down teachers of Bible..
Those that think that everyone is not saved by the love of God is an atheist. That is a given. You are telling God that you know better than he does. So like Satan you can go to hell and glory in your omniscience. With all due respect out of love for Our Lord, you sir are badly mistaken in your assumption. Pope Francis (NOT referred to as Pope Francis I) does most of his homilies at weekday morning Mass "off the cuff". He NEVER mentions the word "heaven" in conjunction with this part of his homily, but his comments do directly follow he speaking of people of various faiths, backgrounds and such getting together for PEACE in the world. THAT, sir is what he is meaning by "meeting us there" - at the table for PEACE. Give our Holy Father some credit sir - he has done nothing but wonderful, Christ-like things since being elected. To say otherwise is simply wrong and NOT Christ-like. KevinGH, that the Pope allows himself to be called the "Holy Father" right there is gross heresy. Our loyalty should be to Jesus Christ, not a church structure, and so it is certainly permissible to question the Catholic Church's apostate teachings that lead people not to their Savior and Heaven but to religiosity and Hell. The Pope may be wrong. I don't know what he exactly said. But here is what the Catholic Church teaches. Once you get there scroll down to YOUR SALVATION title! If good works gets you into Heaven, there was no need for Jesus to die for our sins. We could have taken care of that ourselves. He is so wrong on this. Oh I know the only way to heaven is through JESUS. I was just wondering if they turned his words around.. no one claiming to be a child of God could say that you can work your way to heaven..The site I put seemed to be stating that the Pope didn't mean it the way the news media portrayed it. True, without Jesus Christ's life, sacrifice and resurrection and the love He has for all of us we can not be saved. Grace surely is the gate by which we can enter His presence and be saved. However, if one has faith and is saved in Christ he must also show forth fruits and works merit for the kingdom of god. One can not simply claim in word that he is saved and then live a life not worthy of a disciple. Faith, Grace, Works, Repentance, Service, Sacrifice, Matt. 5, James 2:14-26 are all fruits of a true disciple. The atheist may not be saved by good works, but hopefully when they see the Lord they will bow and confess that He is Lord of Lords. Then may they be on their way to being saved. The Pope's comments do seem to be taken out of context. If anyone wishes to know what the Catholic Church teaches, seek no other source than the Catechism of the Catholic Church (CCC). a nincompoop from the onset and a false prophet, this fool does not even understand the scriptures let alone his own church book. 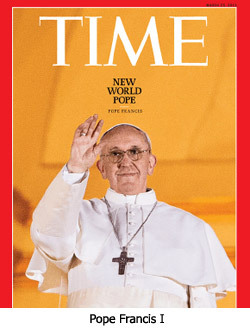 he is the last Pope before the end of the wo0rld, get ready people its coming. this is just another proof of how utterly ignorant and evil this guy is. God said "It is my will that all mankind be saved". Gods will, will be done. It may take time- but all will be saved. Eternal hell makes no sense. It makes life a waste of time. But learning and evolving and turning more towards God does make sense. I just can't see 0-100 years on Earth to get your eternity right. I know I need more time. It is God's will for all mankind to be saved however due to man's sin that will never occur. Man's heart is wicked. IT is also depraved. With all due respect KevinGH, this world in passing away and peace will only come when the Prince of Peace, The Lord Jesus Christ returns to establish his Kingdom. Also, how can the Pope be Christ-Like when he denies the Gospel message that Jesus came to proclaim. Jesus is the only way to the Father and eternal salvation. Futhermore, look at the Apostle Paul and what he did to spread the Gospel message of faith in Jesus Christ alone. Paul was stoned, suffered beatings, imprisoned, shipwrecked not to tell people to do good, but to belive in THE Saviour...The Lord Jesus!!! "God said "It is my will that all mankind be saved"...Gods will, will be done...It may take time- but all will be saved." Jesus said that the two most important commandments are to love God and to love your neighbor (neighbors like the Good Samaritan included). I know some human beings who do the works of Christ because they are filled with the Holy Sprit, even if they have not formally accepted Christ. That is all I know. I have studied the whole works and this is the essence of the gospel. I am so glad the new pope understands this. And yes, he does need a food taster because of such understanding. And we have seen and do testify that the Father (God) sent the Son (Jesus) to be the Saviour of the world. 1 John 4:14. Mariel, I am still studying; the essence of the gospel is Jesus Christ. This pope should spent more time reading the Bible; I agree. He clearly does not know or understand the content. If everyone is going to heaven "through good works", what was the purpose of Jesus dying on the cross for our sins? If it was up to us to work out our salvation; we would all die!